As everyone knows southern belles have an innate knack for planning social events and making sure everything runs smoothly and everyone enjoys themselves. This Southern Belle is true to her heritage. So it would only make sense for Belle to be the one of the Three Friends to keep everything on track for Triangle Street Eats. I realized it was time for us to do another truck review. So after finding out everyone’s schedule for the rest of May, it looked this week end would be best time to get in a review. Remembering how much the Traveler and the Bad Boy wanted to try the Pale Ale POPPERS at the rodeo, I checked to see if Valentino’s would be in our area. We were in luck and I let the Traveler know Valentino’s would be on Hillsboro Street for lunch. The Traveler got right back with me and reminded me we had tickets to see Driving Miss Daisy at 2 pm and it would be a challenge to eat and get to the play on time. 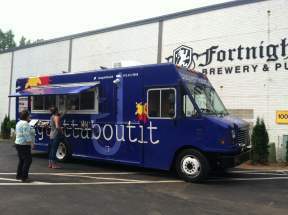 So, I went back to the planning stage again and soon found that Baguettaboutit would be at the Fortnight Brewery from 5 – 9 pm. I presented this to everyone and they agreed this would work just fine. The Bad Boy really liked the idea that the Tap Room would be open for a little tasting. Since we arrived at Fortnight Brewery before Baguettaboutit was scheduled to begin serving, we decided to try something from the tap. I choose the Blonde Ale which was light and a little “hoppy” – very nice. Our early arrival gave me time to look over the menu and I decided on “It’s Greek to me,” a chicken and spinach sausage with tzatriki sauce and pizza. The sandwich did not disappoint me. The baguette roll had a crusty outside and firm inside (just right). The sausage and sauce was a good blend and exemplified the sandwich’s name. The pizza was just OK and was a little difficult to eat. Now, I moved onto my friends’ selections. The U Betcha was exactly as advertised and a good standard for the menu. This left the South of the Border for me to try. Just the description “Habanero Hellfire Sauce” intimidated me. Then I looked over at the Traveler and Bad Boy and they were smacking their lips, wiping sweat off their faces and remarking to each other, “Yeah, that’s got some heat!” As I’ve said before, I am still trying to develop a taste for the hot and spicy but I was afraid this one was going to push my limits. I took a deep breath and forged ahead. The first bite of the South of the Border assaulted me as soon as I put it in my mouth – my lips and mouth felt like they were aflame and the back of my throat was burning. For me this one was too hot but for those who like heat it should be very satisfying. Sampling the offerings of the Fortnight Brewery and food from Baguettaboutit with my friends was a great ending for the day. The Belle, has taken on role of our social director for our food truck adventures. We had tickets to see Driving Miss Daisy at the Fletcher Theatre at the Duke Energy Center. The play was very good, but could not compare to the movie version starring the late Jessica Tandy and the award winning Morgan Freeman. We utilized the services of Uber to avoid the post-graduation and Mother’s Day traffic to and from the play, then on to our Food Truck destination. 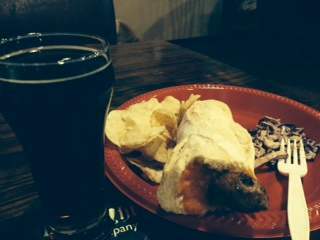 We met up with the Bad Boy to go to the Fortnight Brewery on Northeast Maynard to sample some of their microbrews while dining on the gastronomical delights of Baguettaboutit. I am typically not a beer fan, but found the English Ale palatable. I ordered The South of the Border sandwich, with a habanero sauce and the Schez Slaw. Typically in the North Carolina region when a food item is listed as hot and spicy, it means it will be on the bland side; however Baguettaboutit delivered exactly what they promised. The Habanero sauce was delightfully hot. I felt a tingling on the lips followed by a sensation of heat on my tongue that slowly increased in intensity as I ate. I loved it! The Schez Slaw was a disappointment. It lacked salt. I sampled the Belle’s “It’s Greek To Me” and enjoyed the Chicken sausage with a good Tzatziki Sauce. It was a nice contrast to the heat of the habanero sauce. She also tried the Pizza sausage, which was an open face sandwich with sauce, sausage and lots of cheese. It was okay, but lacked pizzazz and was very messy to eat. The Bad Boy’s U Betcha was ok, but could have used spicier mustard. We had the opportunity to speak with the owners of the Fortnight Brewery and they were very nice. We wish them well and hope they have continued success. It would have been a regular in my college years and may return again to relive some of the experiences. The decision to visit a local brewery, Fortnight Brewery, and sample some handcrafted English style ales, as well as Baguettaboutit’s brats and whatnots, seemed the perfect late Saturday afternoon diversion. Unfortunately, I have yet to develop an appreciation for finely crafted beer and ale, but looking at the brewery through the observation glass, as I sampled a mildly flavored blond, I could appreciate the effort it took to develop the entire selection of libations they offered patrons. If you have developed an affinity for this style of brew, please visit Fortnight Brewery in Cary for an unforgettable pint. As I had observed previously, there exists a symbiotic relationship between small businesses throughout the Triangle Area. I have noticed microbreweries, and food trucks seem to complement one another, and why not? The expense and time of developing a single, unique product is a labor of love, as well as risky, doesn’t leave much room for diversification – say in operating a restaurant – as well. This is where food trucks can fill in a much needed gap, in providing these establishments’ patrons with sustenance, while they sample a fine product. Baguettaboutit provided food for hungry patrons this particular afternoon. Using freshly baked French baguettes to complement locally made bratwursts and Italian sausage, the food was an excellent complement of the beverage. I had chosen the “U Betcha” for myself, in keeping with the theme of “beer and brats.” The U Betcha has a warm, crusty baguette, infused with a full-flavored bratwurst and spicy mustard. I found it complemented my blond ale perfectly. I sampled the Belle’s “It’s Greek To Me” which utilized the same crusty baguette, except with Chicken sausage and a Tzatziki Sauce. I found it a little bland for my pallet. It would be the Traveler’s choice, The “South of the Border” sandwich that took all of us by surprise! Hot Italian sausage with Baguettaboutit’s “Habanero Hellfire Sauce” gave the sandwich some real heat. If you get this, be ready to sweat. We shared a Baguettaboutit Pizza, which resembled an open-faced sausage sandwich with mozzarella cheese. It wasn’t bad, but wasn’t memorable either. Their available side of “Schez slaw” missed its mark. I was not in the traveling mood, so I remained home. The Traveler failed to tell me about the Fortnight Microbrewery. I was upset because I did not get to sample the unique beers from the Brewery. I saw a dog in one of the photos, so pets were allowed. I love hot, so I loved the spiciness of the hot Italian sausage and habanero sauce. I cooled my mouth by drinking a small bowl of cream. I wanted more, but had to make do with other pieces of baguettes filled with sausage. I detest cabbage so I had no intent of sampling the slaw and it’s dressing, which had a brown color that I did not find appealing. I liked the chicken sausage sandwich, with bread bathed in a creamy sauce; the meat had a small amount of heat. The U Betcha sandwich was spoiled due to the mustard. It was sour and unappealing to me; the taste made the sausage unenjoyable. The open-faced sandwich was okay, but difficult for me to get my mouth around due to the shape of the container. I did enjoy the melted cheese. I am looking forward to sampling new food from other food trucks. You never know when I may decide to pay a visit to the trucks. I may need to take a break from my new brother Jack after he arrives.